Tangau (left) being briefed on one of the exhibits at Lab Asia 2017. Second from left is Dr Ong. THE 6th Malaysia Scientific and Laboratory Equipment Exhibition and conference (LabAsia 2017) was held in conjunction with the 25th World Forum on Advance Materials (Polychar 2017) and the 8th Biennial Regional symposium on Total Laboratory management (QSEL 2017). The biennial international trade exhibition for laboratory equipment and services serving the Asean scientific community was jointly organised by ECMI ITE Asia Sdn Bhd and the Malaysian Institute of Chemistry (IKM). ECMI ITE Asia Sdn Bhd, one of the world’s leading organisers of international trade exhibitions and conferences, holds more than 250 exhibitions and conferences annually in 15 countries. More than 6,000 visitors attended the three-day exhibition. 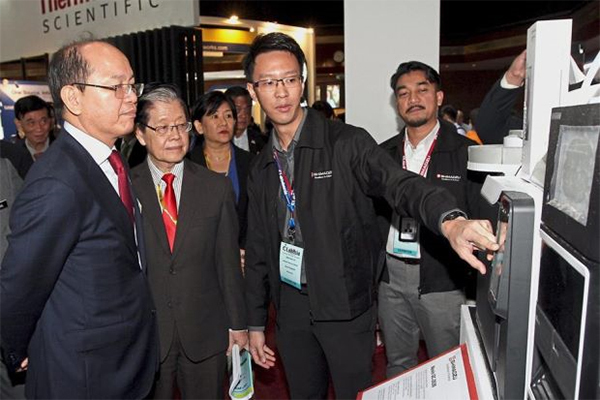 Science, Technology and Innovation Minister Datuk Seri Panglima Wilfred Madius Tangau officially launched all three events simultaneously at the Putra World Trade Centre in Kuala Lumpur. Also present at the opening ceremony were IKM president Datuk Dr Ong Eng Long and founder of Labasia exhibitions C.P. Saw. LabAsia 2017 featured 154 exhibitors and principals from 10 countries, including China, Germany, France, Britain and the United States, showcasing new products and services. Besides the exhibition, it also staged 36 technical seminars, presented by industry experts from around the globe with topics ranging from laboratory safety and management to quality and accreditation systems. To reward visitors, LabAsia held several contests whereby three winners were selected for a two-day all-expense-paid trip to Jakarta to visit LabIndonesia next year, followed by a three-day stay in Bandung.